NeverSeconds: Well done Blod! Hello Long Island! Well done Blod! Hello Long Island! We have been fund raising in school this week as well for Mary's Meals. We've already had sales of porridge, flapjacks and oatcakes. Mr Kipling wrote to me offering to send me some cakes because I won the Observer Award. I asked if I could sell them at a cake stall for Mary's Meals and he said yes. They were meant to arrive today but haven't but I hope they arrive tomorrow early so I can add them to the cake stall. We are also having a non uniform day like Blod but I don't know if we will raise more than your £150! Thank you everyone at Ysgol Kingsland and well done Blod's mum! Joe, Polly and I gave a presentation at school today about Mary's Meals and Malawi. A lady from Mary's Meals came as well. It was nice to do it with my brother and sister because I wasn't alone. We got help with the microphone as we are all different heights. My headteacher gave me a certificate in a wooden frame to say well done. I went a little red. I am going to the Halloween School disco tonight dressed as dad! That's scary enough I think. Our next guest bloggers are from Long Island, New York. Hi Veg! I’m Ms. El and I work in a school on Long Island, New York. This public school only has three grades in it: Pre-Kindergarten, Kindergarten, and First Grade. I asked a couple of our First grade students if they would like to tell you about their lunches for a week. They enthusiastically replied, “Yes!” So without further ado, I’d like to introduce you to Zee and Sunflower. Mouthfuls: Sunflower ate her entire pizza, she counted 53 bites. Recess: Indoor, it was raining. We watched a video about children with food allergies so we know not to share food with each other. Sometimes if it’s raining we play crab-soccer. I (Ms. El) had a school lunch as well. I chose pizza just like Zee and Sunflower. The lettuce salad had cucumbers and carrots in it, and the chickpeas were dressed with red onion and herbs. I chose an orange over the apple and fat-free milk. The kids had these options as well. They must have one fruit serving and one vegetable. The US government famously ruled last fall that tomato sauce on pizza is to be counted as a vegetable serving. So, both Zee and Sunflower had their fruit and vegetable serving today. 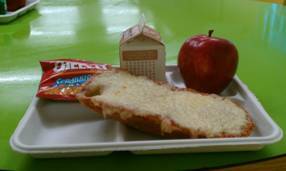 The cheese crackers, Pop-tart, and water bottle were not included in the price of lunch; their parents allow them to buy extra snacks today. 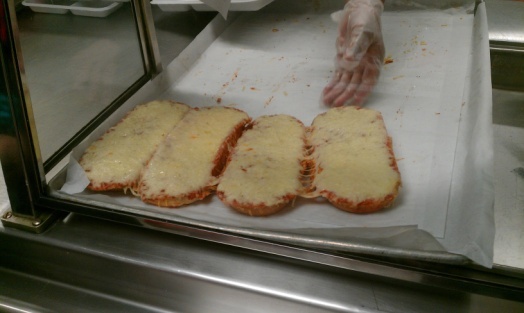 French bread whole wheat crust Pizza was the “A” lunch option today. 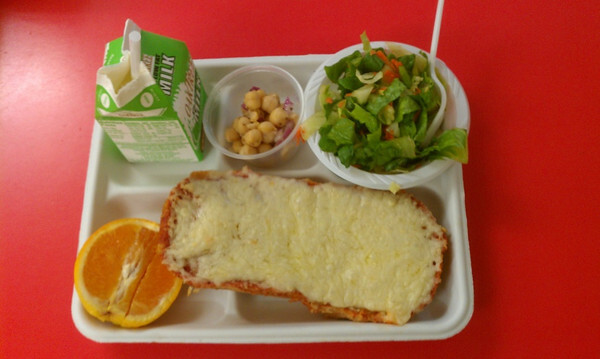 The “B” lunch offered was Turkey sandwiches on whole wheat bread. 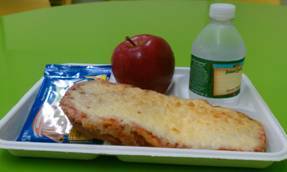 The cafeteria also offers peanut butter and jelly sandwiches, cheese sandwiches, and salad every day. We had so much fun writing about our lunch experience! Can’t wait to tell you about lunch tomorrow. Ms. El, Sunflower, and Zee. The US government famously ruled last fall that tomato sauce on pizza is to be counted as a vegetable serving. just because it comes in a sauce means it's suddenly evil. Did I say something about evil? I might have implied the term "unhealthy", but hey just my european opinion. Veg isn't feeling comfortable enough at school dinner time to blog at the moment. thanks for all your postings - i love to read them! You wonder why all people are looking in different direction? 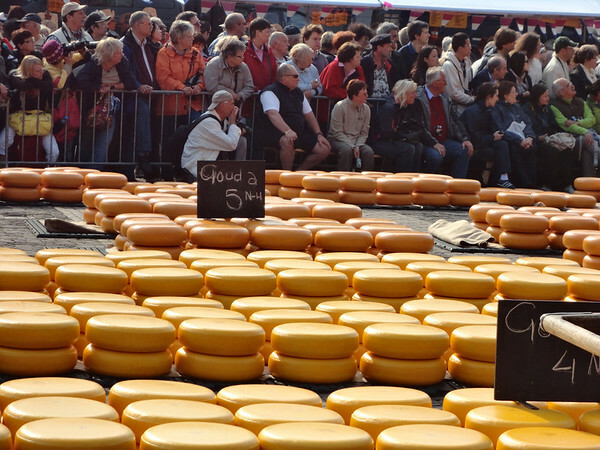 In Alkmaar at the cheese market there are men carrying the cheese from the seller to the buyer, like this: http://en.wikipedia.org/wiki/File:Alkmaar.jpg ... i guess they are all watching these men (I watched this market some years ago when i was at your age :-) ). greetings from Vienna to all of you! Ooh, another Long Islander! I'm desperately curious to know which district this is (though I think Long Island has over 100 school districts, so you may be a distant neighbor!)! I'm a grad-level Early Childhood Ed candidate and the only school I've been placed in with separate Early Childhood buildings was in Amityville, where I'm doing hours now (but they have a Pre-K/Kindergarten building and a First/Second/Third grade building). I come in after lunchtime so I've never taken a look at what they eat - maybe I'll pop into the caf tomorrow and investigate! When I attended school back in the 70's and 80's in the US, Ketchup was approved by the government as a veg which is just as bad as approving the sauce on pizza as a veg. Actually, the school lunches were very good. Yeast Rolls and desserts like cookies or cobblers were made from scratch and very few convenience foods were served. Sunflower is an unusual but good name! As an American myself, it only seems totally in-character for our government to decide that the tiny amount of tomato (which is actually a fruit) sauce on a serving of pizza counts as a full serving of vegetable. I fully expect them to proclaim, this year, that a teaspoonful of sugar-laden strawberry jam on a piece of bread counts as a full serving of fruit. Sometimes we play crab soccer here. It's an indoor variation for confined spaces. As it is too dangerous to run about, the children sit down and have to move about whilst still in the sitting position using their hands and legs, like crabs. They will kick a soft ball at a target to score, such as a gymnastics bench. It is a useful game if the weather makes it impossible to take a club or lesson outdoors. When I was in school and we'd play crab soccer we'd be on our hands and feet but face up with hands stretched backwards. We still couldn't touch the ball with our hands, you could only use your feet. You could push back on your hands to lift up and kick. Usually in place of a soccer ball we'd use a really large softer ball as well. Well done Veg, Joe and Polly giving a talk - hope you enjoyed it and you weren't too nervous. A great idea to have a sale to raise money, hopefully the carrier of the Mr kipling cakes has eaten them and they will turn up today for you. 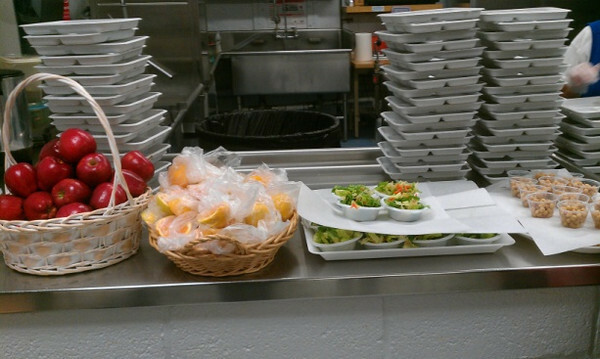 Welcome Ms. El, Sunflower, and Zee, great post and look forward to reading about more of your lunches. Tomato is extremely good for you whether raw or cooked, although it is a fruit (berry) not a vegetable. Thanks, Ms. El. Very interesting. I wonder whether the children should be told that milk is healthy too - they need the calcium, especially at their age. Nice to see fruit and Vegetables on there. A long time ago (1970s 1980s) I remember not liking school dinners. They were healthier than some of today’s twizler and chips with choco milk. My mother was a great cook, so most things were nowhere near as good. Today I thank her, as I enjoy food cooking and eating. This is a great blog, very inspirational. Ah, thanks for the explanation, TR! Sounds rather like an exercise we used to do in ballet class called the "crab walk." I can see where playing soccer like that would still use up a lot of energy, but would be much more approprate for an indoor sport. 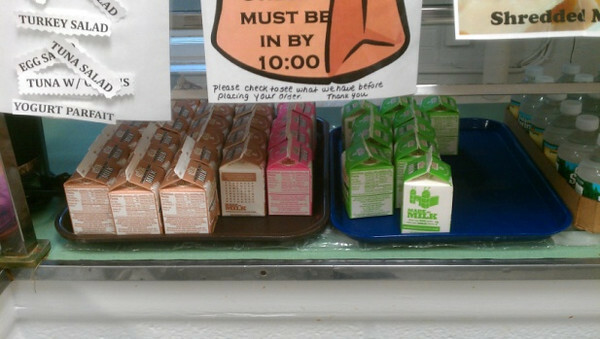 This looks a lot like the school lunches I grew up with except that was before they started ruling more in favor of healthy options being mandatory.